John Frost by special arrangement with Jed Bernstein and Adam Zotovich present, DRIVING MISS DAISY by Alfred Uhry at the Theatre Royal, Sydney. 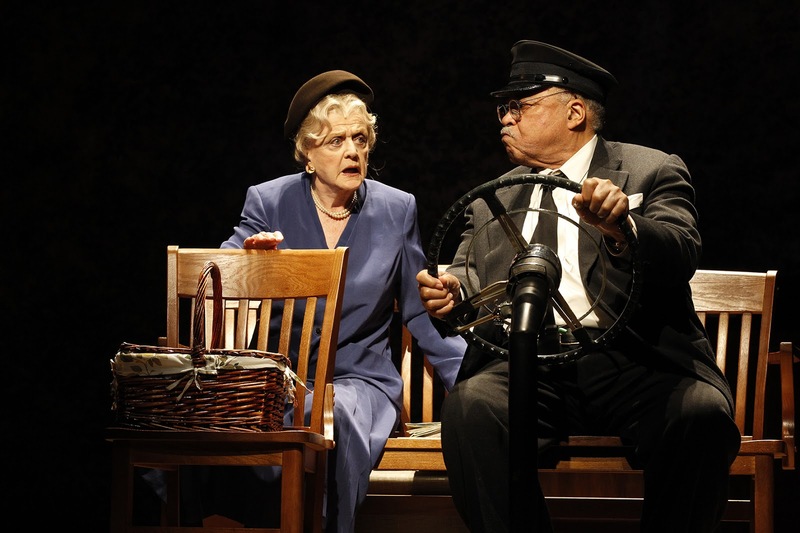 DRIVING MISS DAISY (1987), a Pulitzer Prize winning play by Alfred Uhry, is the first part of what has become known as his ATLANTA TRILOGY. The other two works being THE LAST NIGHT OF BALLYHOO (1996) and PARADE (1998) - a musical with the score by Jason Robert Brown. These last works were winners of Tony awards. DRIVING MISS DAISY became a film directed by Bruce Beresford and the winner of four Academy Awards including Best Picture and Best adapted Screen play (1989). This is a ninety minute journey covering some 25 years of personal history through the 1950's and 1960's at the height of the Civil Rights Movement, in the city of Atlanta, Georgia. Daisy Werthan (Angela Lansbury) can no longer drive, being 70, and not as agile as before. Her son, Boolie Werthan (Boyd Gaines), hires a driver, Hoke Coleburn (James Earl Jones). Miss Daisy and Hoke are two strong minded survivors of an eventful and terrible century, living through the oppressions and fears of discrimination. Miss Daisy being a Jew and Hoke an African American. In short vignettes we watch these two individuals, under the watchful eye of her son, develop a relationship that begins reluctantly, that blossoms into mutual respect, and ultimately, to an affectionate and tight regard. The short scenes are poignant in their telling, sometimes humorous, sometimes wise, sometimes dramatic, but always beating with an empathetic heart within small scale observed domesticities of these aged, but, open hearted individuals - the Michael Haneke film, AMOUR stood, in my participation on Saturday night, serendipitously, in my consciousness, beside and behind this production and these beautiful performances. The story telling is gentle and crafted to move the audience. And it does so, mightily, as a simple human story in the foreground of the great political battle for basic Human Rights. Discreetly, Mr Uhry introduces Martin Luther King, one of the important figures of that bigger background story as a focus for this couple. I found it a particularly powerful reference, when thinking/relating back to the recent highly awarded Australian film, THE SAPPHIRES, directed by Wayne Blair, recalling how Mr King and his imagery were used as a subtle strength to that story of the Australian Indigenous Aboriginal, and their parallel struggle for their Civil Rights. I felt no sentimentality in watching this play, as some might feel, but rather a confirming of the justice of the message behind the story.The ease I had to personalize this American story, as an Australian, is surely why this small, delicate work has so much resonance for the audiences it has reached. Mr Uhry in interview has tried to explain the play's power, he summed it up simply: "I told a truth; it was true." The core truth, here, is a universal one and the recent response of Sydney audiences to THE SECRET RIVER echoed to me while watching DRIVING MISS DAISY. The Play is the Thing. It is always so for me, and Mr Uhry's DRIVING MISS DAISY is a beautifully crafted story of personal and cultural resonances. Small in scale but great in affect. This production, has been lovingly nurtured by director David Esbjornson - who has wholly integrated the commitments from all the artists involved . They are of the highest order. The directorial visions and accomplishments are discreet, all geared to service the narrative telling. The scenic design by John Lee Beatty is in a three sided box, simply painted, with a stripped back furniture selection of the necessities of highest quality, and is dominated by an elegant moving wooden stair case.The scenic changes are arranged dexterously with sleight of hand stage machinery. The lighting (Peter Kaczorowski) captures mood and narrative supported by a subtle video/projection design of images and film (Wendall K. Harrington) that give information and a depth to the visual expression of driving through 25 years of history: the passing paarade. Music by Mark Bennett in the Sound Design by Christopher Cronin is simply apt and charming every time - sometimes folksy, sometimes, with an epic breadth. Costumes by Jane Greenwood of subtle narrative clarity that have a theatrical beauty of a kind that it is all seen as clothing rather than costume. Added to that, is this great gift, this present from Mr Frost and the other producers, of bringing to Australia, two legends of the theatre and film world: Angela Lansbury and James Earl Jones. I do recommend that every true theatre goer not to miss the performances of these luminous veterans, in an object lesson in acting, beautifully matched, by the way, by Boyd Gaines. I encourage every student of acting to attend to the matchless craftsmanship and art of these three actors, but especially the nominal stars. I cannot imagine why these two actors, of some seniority, would feel the need to travel half way round the world, to put themselves through the uncomfortable destabilising of a foreign living environment, for months, and then endure the daily stress of performing (not ever to be underestimated) in a very demanding work, whatever one's physical age, except that, they love what they do. These two actors appear from the opposite wings of the stage, facing each other over the width of the proscenium and are lovingly greeted with tremendous applause. A very frightening hurdle for any actor - "If the entrance is enough to cause you to applaud what will I have to do to sustain your regard?" must have flashed through their minds, as gratifying as it may have been. I felt for them, very much. No need to concern myself, really, for these two actors assumed focus and before our eyes adjusted their physical instrument to that of seventy year olds and began throughout the night, subtle, but definite, choices of body-ageing that Daisy and Hoke accumulated over the 25 year stretch of the play telling. Note the body of these actors on play commencement, observe the final moments and then study the curtain call physicalities. Amazing artistry, discipline. It brought tears to my eyes, in admiration. The acting between the textual requirements is lovingly detailed and communicated, laughter evoked from the audience with a shift of eyes or lift of eyebrows, flick of hand - consummate technicians, calculated with a sense to the audiences attendance and responses. Alive and alert to us. Vocally assisted with microphones, the text is deftly communicated with immaculate timings to tell the story, reveal the emotions and to gain comedy. The communication, connection between the actors appears to be one of selfless trust of ensemble support. The writer well, and truly, served. At the end of the play not only did the audience applaud but, all, gave the performance a standing ovation - not always easy to get from an Australian audience - let alone a Sydney audience! These two magicians of the craft of acting create art. Their power is such that we effortlessly create with them. It is worth participating with them. You will remember the time you spent with these two loyal servants of the theatre for a long time, I reckon. This production is no fob from the centre of New York to the antipodes, three old veterans on a holiday, this is a showcase to relish and to set a benchmark for your future performance viewing, as a reference to quality. Two stars, of still immense brightness, fed by the love of what they do. P.S. One hopes that the artistic leaders of our major companies observe this class act on the Theatre Royal stage. Every element of every choice in every area of design (look at the chairs, staircase; check out Ms Lansbury's travelling coat towards the end of the play - classy! ), and every element of the acting is impeccable, and nothing is a half-baked consummation of good intentions, rather thought through attentions to the suitability of the presented materials to achieve affect. It represents detailed embodiment of creative ideas. I could not help but compare, for instance, the set and costume embodiments on the stage at Wharf 1, where I saw MRS WARREN'S PROFESSION last week, with this work. Is it the budgets that makes the difference? Or, is it just the care of craftsmanship that makes one enterprise entirely seamless and elegant and the other sometimes jarring and clumsy in judgement and execution, unfortunately drawing notice for the wrong reasons? Compare and contrast. Having just travelled in Europe, and observed work in the theatres there, I can only carp at the moment, at my dissatisfaction with the production care of aesthetic values from our major companies. Near enough is not, really, good enough. Two touring productions from the National Theatre are due in Sydney:WARHORSE and ONE MAN, TWO GUVNORS. For further comparisons and contrasts of the fine details of the design elements,check them out. You will see what I mean.